Solution: Write the symbol of each atom using the AZX format. Write the symbol of each atom using the AZX format. Fill in the blanks to complete the table. Define atomic number and mass number. 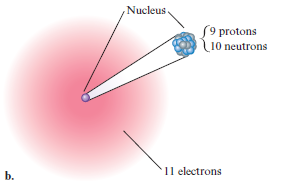 Where do the protons reside in an atom? How and by whom was the electron discovered? Determine the number of electrons in the Cr3+ ion.